Your backpacking tent is your home away from home on the trail. It should make you feel safe and comfortable and it should be easy to set up. When you encounter inclement weather in the backcountry, you’ll want a quality backpacking tent that keeps you warm, dry, and safe from the elements. Our list of the Top Ten Backpacking Tents includes great options from the industry’s leading brands, as well as budget-friendly selections perfect for anyone just getting into backpacking. Be sure to also read through our Buyer’s Guide for a thorough breakdown of all the criteria you need to consider to help you select the best backpacking tent for your needs. This freestanding, lightweight tent is ideal for solo getaways. The tent body quickly attaches to aluminum poles using quick pole clips to make assembly a breeze. Extra-large (#8) (1) zippers on the door and vestibule of the tent are easy to use and durable enough to handle abuse. The ALPS Mountaineering Lynx is a 1-person tent with mesh walls for increased ventilation. This backpacking tent also features a 75-denier polyester rain fly that resists UV damage and factory sealed seams for superior weather protection. The Sierra Designs Clip Flashlight 2 is a three-season backpacking tent that offers generous living space. It offers a fast and easy two-pole set up to make putting it up a breeze in the event of inclement weather or another dire need. This backpacking tent contains a full mesh body for better ventilation and a large, full coverage vestibule. Additionally, this non-freestanding tent features a D-shaped door, removable rain fly, interior mesh pockets, and reflective guy lines and guy out loops to make it easy to find after you’ve popped out to relieve yourself in the middle of the night. The unique design of this tent is particularly suited to the ultralight, all-season mountaineer. The Black Diamond Beta Light Tent is a two-person, floorless shelter that folds into a compact package and weight very little. This backpacking tent is a full-coverage, SilNylon-shaped tarp that sets up easily with your trekking poles. It withstands wind, rain, and snow and can be paired with the optional Bug Net and floor for a complete structure. Ideal for the ultralight backpacker, this tent also includes reflective line and line tighteners for additional stability on windy evenings. Great for the backpacking couple, this two-person backpacking tent is designed with a 4-way, high volume hub that increases its strength by 25% and overall volume by 20% (when compared to previous models of the Copper Spur). The tent body is made of proprietary patterned, breathable rip-stop nylon and polyester mesh. 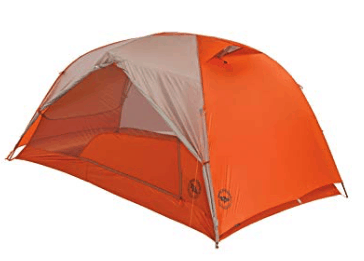 The Big Agnes Copper Spur HV UL2 has a fly and floor that are both made of silicone treated rip-stop nylon that is finished with a 1200-millimeter waterproof polyurethane coating. In addition, they feature a unique weave that is constructed with high tenacity yarn and a high filament count. This unique weave serves to increase tear strength by 25% and improve water resistance, all while decreasing the overall weight of the material. Designed for the lightest of ultralight backpackers, the Nemo Hornet is one of the lightest tents on the market. With a total weight of just 2 pounds, this tent still delivers the durability, packability, and stellar weather protection that ultralight backpackers and thru-hikers need. This backpacking tent offers true tub floor construction, which reduces seam construction and seam tape. This effectively creates a more durable waterproof floor and this tent also boasts a 1200-millimeter nylon ripstop fly that has been carefully optimized for increased ventilation and superior rain coverage. This lightweight, freestanding design creates excellent living accommodations for solo backpackers that require a true, 3-season backpacking tent. The tent body is constructed from 40-denier ripstop nylon and 15-denier nylon mesh. The MSR Hubba Hubba NX offers a unified hub-and-pole system with color-coded clips for simple, quick setup. This tent boasts plenty of head and elbow room throughout, as well as a large, side-entry vestibule for storing shoes and gear. Lastly, this tent features a StayDry (2) door with built-in rain gutter and an adaptable, cross-ventilating rainfly. The North Face Summit Series Assault 2 is a true expedition-style backpacking tent designed for high-altitude camps. It offers both superior breathability and stability against the elements and comes with a total floor area of 27.3 square feet. This backpacking tent used a pole-supported ventilation system. When wind strikes the tent’s broadside, it backfills the tent’s interior and equalizes the pressure to create an overall stronger structure. This tent is constructed with nylon ripstop, nylon mesh, polyester ripstop, and nylon. It also features a removable vestibule, ample stabs for hanging items, an easy-pitch X-tent design, and DAC (3) stakes. The Marmot Limelight is an excellent choice for anyone looking for a truly luxurious sleeping experience in the backcountry. Perfect for backpacking tandems that like to bring their pets along on the trail, this three-person tent is lightweight and easy to set up while offering a large enough footprint to sleep everyone comfortably. This backpacking tent boasts a D-shaped door that allows no-step entry and exit, which is great for keeping your sleeping gear dirt and dust-free. It also boasts color-coded webbing and poles to ease the setup process. Finally, this tent features a roomy vestibule with plenty of space to keep your gear dry in wet weather. Great for anyone looking for a budget-friendly, all-around backpacking tent, this two-person selection from Kelty offers a spacious interior for a comfortable backcountry escape. This three-season tent also boasts a total of 10 square feet of vestibule space for your gear and shoes. The Kelty Salida backpacking tent’s walls are made of 68-denier polyester and 48-denier No-See-Um mesh. The tent’s floor is constructed with 1800-millimeter, 68-denier nylon. The freestanding tent offers fully seam taped construction and has a total floor area of 30.5 square feet. Finally, this tent features a number of internal storage pockets and comes in a roll top cube carry bag. This two-person backpacking tent offers a freestanding, aluminum two-pole design that can be set up quickly and easily. It’s the perfect tent for a couple that likes to spend more time exploring than they do making camp in the evenings. The Zephyr’s polyester rain fly resists both water and UV damage and offers two vestibules for true “His” and “Hers” compatibility. This tent is also great for backpacking in hotter climates, as it contains two mesh doors and entire mesh walls. In addition, this tent features aluminum stakes and guy ropes, a useful gear loft for headlamps and other essentials, and internal mesh storage pockets. Selecting the right backpacking tent requires you to be honest about how you plan to use it. Knowing the kinds of trips you plan to take, and in what environments those trips will most likely occur, will help you narrow down your choices. That said, a more intricate understanding of how backpacking tents differ in size, shape, and performance is also extremely useful. In this Buyer’s Guide, we will focus on the more important information you need to know to help you make the best selection possible. Freestanding tents will remain upright whether you stake them down or not. This makes them much easier to pitch and then move around camp until you find a flat spot that suits your liking. It’s important to remember that all tents should be staked down to prevent them from blowing away (and also to maximize their performance), but freestanding tents, in general, have a more rigid, fixed structure without the use of stakes. Non-freestanding tents, as you might guess, require stakes to hold their structure. This makes pitching them in sand, snow, or on rocky surfaces a bit more difficult. It’s not impossible, however, and non-freestanding tents are also lighter and more compact than their freestanding counterparts, in general. Tents come in many shapes and sizes. In this Buyer’s Guide, we are going to talk about six distinct tent shapes, and dive into the pros and cons of each. Those shapes are A-frame, modified A-frame, dome, hoop/tunnel, pyramid/teepee, and wedge. A-frame tents are the simplest setup and, as such, they are the lightest and least expensive of the bunch. They feature sloping wall, which does limit head and elbowroom. As a result of the broad sides that are characteristic of A-frame tents, they tend to be more susceptible to high winds, making them a better selection for mild conditions. The modified A-frame utilizes a hoop (or “ridgeline”) pole to create curvature in the exterior walls. In doing so, they offer more interior space and improved structural stability when compared to traditional A-frame tents. Dome tents are arguably the most common design. Because of this, they come in many shapes, sizes, and pole configurations. Arched ceilings are the giveaway characteristic of all domed tents, and this design offers good interior space and stability when the winds pick up. Hoop/tunnel tents (also known as “tube tents”) are generally lightweight and resistant to heavy weather. Unlike most dome tents, however, hoop tents are not freestanding, which means they require proper staking if you’re going to achieve the intended shape. Pyramid, or teepee, tents are constructed using a rainfly that is supported by a vertical center pole. The rainfly is then staked out to form the pyramid shape. In terms of space-to-weight ratio, these tents perform at the top of the pack. That said, their floorless design makes them a non-starter for wet conditions. Finally, wedge tents are typically higher at the head end and then sloped down towards the feet. This design makes them more aerodynamic in windy conditions, as long as you pitch them with the low end into the wind. Headroom, however, is significantly less in a wedge-style tent. Square footage is the easiest way to know if a backpacking tent is going to have enough room for you, your partner, your pets, and anything else you want to keep safe overnight. That said, you should also make sure to check out the exact dimensions of each tent you’re considering. Taller hikers, for example, should make sure the tent has enough length to stretch out comfortably. Conversely, those of us with stouter builds want to make sure our tent has enough elbowroom so that we’re not whacking our partner every time you turn over at night. The wall slope of a backpacking tent largely dictates the total headroom inside. If you’ve ever been stuck inside your tent for hours on end while waiting out a storm, you know how important headroom can be. Tents with consistent headroom from end-to-end are obviously going to be best for hosting those foul weather gatherings. Sloped designs, while being better for ultralight backpackers, rarely offer enough headroom for one person to sit up comfortably, let alone multiple. There are basically two types of tents when we talk about doors. There are those with one door and those with two. Tents with a single door tend to be lighter than double-door tents, but their drawback is that one person will inevitably end up climbing over the other to get out in the middle of the night. Two-door (or ‘double-door’) tents can significantly increase the “livability” factor of your outdoor experience. Each person has his or her own entry/exit, as well as a place to store gear that is protected by its own vestibule. When looking at the material used to construct tent poles, you’ll usually find manufacturers have used one of three common materials: fiberglass, aluminum, or carbon fiber. There are pros and cons to each, which we’ll go over quickly here. Fiberglass is typically used in less expensive, lighter duty tents. When compared to the other two materials, fiberglass is cheaper, but also heavier and significantly less durable. Aluminum, on the other hand, is used in a vast majority of solid backpacking tents because it is strong, light, and easy to replace. Carbon fiber is utilized on the high-end tents that are super-light and still super-strong. The downfalls of carbon fiber are that it tends to be more expensive and also less durable than aluminum. Pole connections refer to the manner in which your tent poles connect to the tent body. There are two main types of pole connections: sleeves and clips. Again, let’s examine the pros and cons of each. Sleeves are sewn onto the body of the tent. Poles are then fed through the sleeves along the tent body and attached (or otherwise connected) to the tent’s corners. This creates a solid structure that’s great for handling wind. That said, sleeves tend to make the set up more difficult (remember poles getting disconnected mid-sleeve when you were setting up tents as a kid?) and also reduces airflow between the tent body and the rainfly. As a result, condensation can become an issue without proper ventilation. Clips are also sewn onto the tent body, but they are lighter plastic clips that hook onto the tent poles to make construction a very quick and easy process. In turn, this design increases airflow to the interior of the tent, reducing the likelihood of condensation. The only downfall, however, of the clip design is that tents that utilize it can be less stable in high winds. Most of the tents we’ve mentioned use double-wall construction, but some (like the Black Diamond Beta Light) are known as single-wall tents. There are advantages and disadvantages to both construction types, so let’s look at them. Double-wall tents are much more common and you’re probably familiar with their setup already. They use an inner canopy (the tent floor and body) and a rainfly. The inner canopy provides the enclosed structure to sleep in (and can be all that’s necessary on warm, dry nights) while the rainfly keeps water out. Tents that use double-wall construction are generally less expensive, drier in wet conditions, and provide better ventilation. Single-wall tents use just one layer of waterproof and breathable fabric to protect you from the exterior elements. This makes them lighter and, generally, easier to set up. Condensation, however, can be a problem with this type of construction if the tent isn’t properly vented. Some single-wall tents feature a hybrid design that uses a partial rainfly (usually over the door) to reduce condensation. A vestibule is the entryway of your tent. It’s the perfect place to store dry, dirty gear without tracking it inside your tent and onto your sleeping gear. This is where your boots come off before you enter, as well as where your pack can live overnight. While most vestibules don’t have a floor, they are covered, which is essential for any true three-season backpacking tent. When considering vestibule design, there are a couple things to keep in mind. First, make sure the vestibule will provide ample room for you and your gear. Ideally, your vestibule should have enough room for you to cook underneath on a particularly wet day. Also, make sure to inspect the drip line of your vestibule. If you decide to open it to allow additional airflow into your tent, make sure any moisture that has accumulated on the rainfly isn’t going to drip directly into your tent. New tent designs are released annually and even the most seasoned backpackers must make sure they are up-to-date with the latest recommendations on buying, cleaning, and caring for a quality backpacking tent. This section will answer some of the most Frequently Asked Questions about backpacking tents. A tent footprint is a ground cloth that is placed on the ground prior to setting up the tent body. The tent body is then placed on top of it. This reduces wear and tear on the floor of the tent itself, especially in sandy or rocky environments. The idea is that it’s much easier and cheaper to replace a footprint than it is to replace an entire tent. What does my tent have condensation building up inside of it? Condensation happens when humid air hits a colder surface. In the case of your tent, the humid air is most likely coming from your own exhalation and that colder surface is typically the interior walls or roof. This happens when your tent is lacking proper ventilation. A couple of ways to avoid this condensation is to roll back the tent’s rainfly and place any wet clothes or shoes outside before you go to bed at night. There are many more potential causes for tent condensation as well (4). What if my rainfly is wet in the morning? In all actuality, you’ll probably find that this is the case more often than not when backpacking. Just remove the fly first thing when you wake up and let it dry in the morning sun as you prepare breakfast and get ready for the day. You can also simply un-stake the entire tent and re-position it to be in the sun. If you don’t have time to thoroughly dry the fly before hitting the trail, just pack it up somewhere handy so that you can take it out to dry it further during a long lunch break or first thing when you get into camp in the evening. Seam sealing is usually done with a liquid urethane that is applied to any affected seams. In general, when stitching joins two waterproof materials, there will be thousands of tiny holes that water can flow through. Seam sealing prevents this but is only absolutely necessary for any exposed seams that will not be adequately covered by the tent’s rainfly. Whether you’re just going out for an overnighter or heading out to hike the length of the PCT, you have to be comfortable setting up, breaking down, and sleeping in your backpacking tent. This article is designed to give you all the information you need to select the right backpacking tent for your needs. We hope you’ve enjoyed the information presented above, and we wish you all the best in your selection process. Happy trails!